I’ve noticed in the UK a lot of broadband providers are pushing Wireless access points, notably BT. So this provides fertile soil of innovative products around the house. For example I am keen to get better “visibility” of how I consume electricity here on Praze Farm. It is fairly straightforward to plot the data in a nice SVG graph, though getting that data is the hard part. 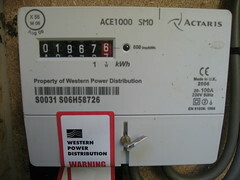 Introducing the Wireless electricity meter. A device which joins your wireless network, that runs a Web service where one can read the meter via REST. So I could plot this data in an internal Web application (could also be on the Wireless meter device) so I can see how I use my electricity and understand how I can save electricity too. Perhaps if the Wireless broadband access point was smart, it could securely route requests from our Electricity company to read the meter remotely. This could save a lot of money.